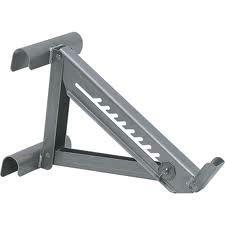 Spans 2 rungs; Will accommodate planks up to 14" wide; Recommended for use with Type 1A or 1AA ladders; Short body; Meets OSHA requirements with 250 lb. Type 1 ladder. * Please call us for any questions on our ladder jacks pair aluminum rentals in Eden Prairie Minnesota, Bloomington, Chanhassen, Minnetonka and surrounding Twin Cities communities.